We decided to turn right toward Big Bend rather than left to Carlsbad Caverns due to the extreme cold weather coming into the middle of Texas. South sounded good to us. 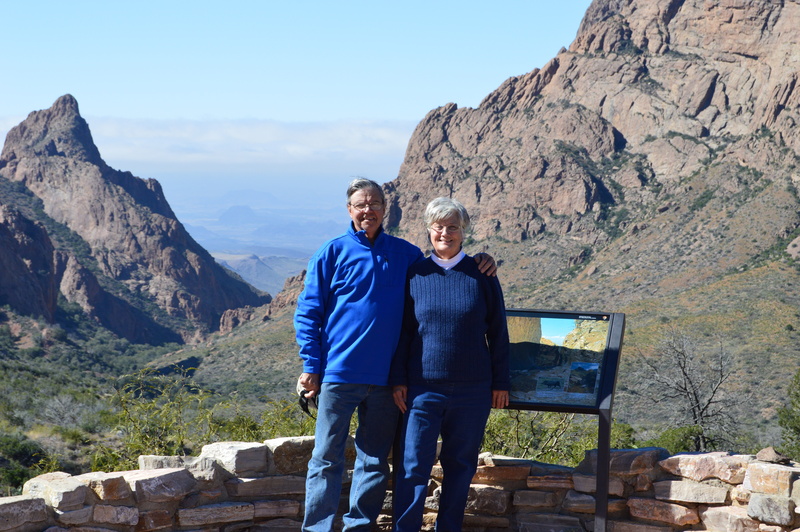 We did not escape the cold completely but we did enjoy the Big Bend National Park. It reminds me of a reverse Grand Canyon. At the Grand Canyon, we look over and down to the canyon walls but at Big Bend we are on the floor of the canyon with the walls coming up around us. It too is an amazing experience! Words cannot describe the emotions that one feels gazing at the expanse of scenery all around. We spent four days and nights here and will definitely return for a longer stay. We did spend one day inside our warm rig reading novels and eating hot soup and goodies waiting for the winds to die down and the temperature to rise above 30 degrees. It was only a one day inside and the rest of the time was good weather. We did a few short hikes, drove the scenic byways and viewed the vistas over the Rio Grand and into Mexico. We did not cross the border as there was just too much to see on this side for now. What surprised us was that the park is huge and vast but the crowds are few. The full hook up RV sites were mostly full, but the boondocking sites were not. It was just before the season actually started and we were told that it would be packed full within the week. However, it is still a lot of space to fill with so few parking areas. I can’t see that it would be filled with masses of people even if it were booked. It s far away from everything. We drove 132 miles from Fort Davis to the Big Bend Headquarters, then another 20 miles to the campsite on the Rio Grand. It was 26 miles from our campsite to the hotel and the more remote small RV and Tent campsites. We were breathless everyday with the sites of birds, small wildlife and tracks of deer. Again we saw no black bear nor any sign of bobcat, which is fine. I believe that they are there and I don’t personally need to meet them face to face. Big Bend is one of those places that I should hope many of us get the opportunity to see. We will return! I think we’d like to take the trailer there someday! I hope that you do! We want to return once we are capable of boondocking off-grid (meaning not needing electricity). Almost there.